Many people favor dry whites over any other type of wine. 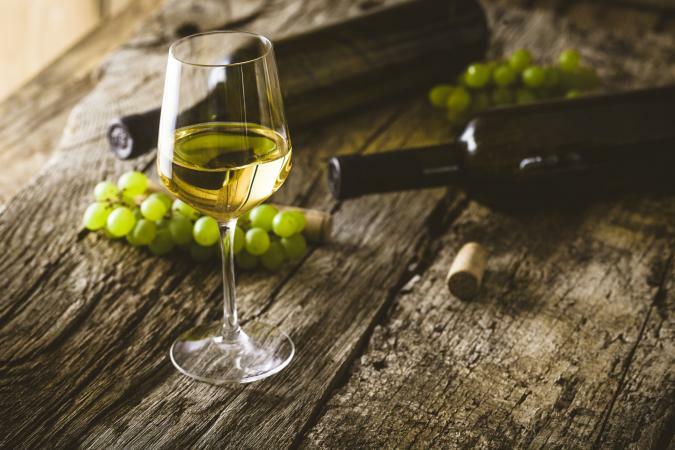 Wines like Sauvignon Blanc, Pinot Grigio, and Riesling are produced around the world, and wine drinkers value them for their crisp flavors and easy ability to pair with foods. You can drink dry whites any time of year, but they are especially refreshing during the warm months of summer. With so many varieties of dry white wine, there's a white that suits almost any palate. Wine grapes have varying degrees of natural sugars depending on the varietal, how late in the season the grape was harvested, and the level of concentration of the juices. During the fermentation process, yeast converts sugars from grape juice into alcohol. When a majority of the sugar is converted and residual sugar is less than one percent of the wine's volume (four grams of sugar per Liter), the wine is considered dry. Wines can also be considered medium dry if it contains a residual sugar of 12 g/L. Wines with higher levels of sugar are medium, or sweet. Sweet and fruity are two terms are often confused in wine terminology. A fruity wine is not necessarily a sweet one, and the driest of wines can still have multiple fruit characteristics. Fruity does not necessarily describe the wine's level of sweetness but rather its fruit characteristics. For example, Riesling may taste of apples, or Sauvignon Blanc may have flavors of gooseberries. These wines contain less than 4 g/L of residual sugar. This is one of the driest, crispest wines. This lean, clean wine is often herbaceous with well balanced acidity and underlying fruits. You can find Sauvignon Blanc grown around the world. Major growing regions include Bordeaux, New Zealand, the Loire Valley, South Africa, Austria, California, and Washington State. This dry Spanish white has bright acid and flavors of citrus. It is delicious with the Seafood that is plentiful in Spanish cuisine. The Portuguese call it Alvarinho. The Burgundy region of France is well known for its excellent Chardonnay wines. In fact, Chablis from France is made purely from the grape. Wines from this region are redolent with flavors of applies, citrus, and flint. New World versions from California and Washington State are aged in New Oak, and tend to be toasty with vanilla flavors. This light bodied wine is extremely dry. It is also sharp, tangy, and delicious. This wine comes from Loire Valley. These wines may have as much as 12 g/L of residual sugar. Pinot Blanc, a white from regions like Germany, Austria, Italy, and Alsace, France, has similar flavor profiles to Chardonnay, but with less complexity. In Italy, this wine is called Pinot Grigio. Elsewhere, particularly Oregon and France, wines from the same grape are called Pinot Gris. These wines are light, crisp, and fruity. Viognier is a very fragrant grape. In fact, in France's Côte-Rôtie wines, winemakers blend a little Viognier with the Syrah to add an enticing scent with a nose of citrus. You can find Viognier from Condrieu and California. Austria specializes in this peachy wine with undertones of pepper and spice. Germany and Alsace specialize in this spicy, aromatic white. You can also find good examples from New Zealand, Oregon, and California. Not all Gewürtztraminers are dry. This grape is also popular in a sweeter, late-harvest version. If you're looking for dry, choose a German trocken or halbtrocken version. Another wine grape that thrives in the cooler climate of Germany and Alsace, Riesling can be dry or sweet. The acidic wines have flavors of minerals, stone fruits, and apples. You can also find examples of dry Rieslings in Washington, Oregon, and California. Champagne (and sparkling wines in the rest of the world) is also a type of dry white wine. While many Champagnes are dry, the region has its own sweetness classification. Extra Brut is has less than .6 percent residual sugar. Brut contains less than 1.5 percent residual sugar. Extra Sec has 1.2 percent to 2 percent. It is a medium-dry wine. Sec has 1.7 percent to 3.5 percent residual sugar. Demi-Sec contains 3.3 percent to 5 percent residual sugar. Doux contains 5 percent or more residual sugar. Crisp wines like Sauvignon Blanc pair well with light, bright foods such as halibut with lemon. Oaky wines with toasty flavors like you'd find in Chardonnay work well with rich, fatty foods, such as lobster with butter sauce or fettuccine Alfredo. Spicy whites like Riesling or Gewürtztraminer hold up well to spicy foods, such as Asian food. Champagne and sparkling white wines work well with foods that have salty or umami flavors. A fruity white like Pinot Grigio works with delicately flavored foods, such as shellfish. Don't let the term "dry" intimidate you. While dry whites have little sweetness, most are very accessible. They are especially wonderful when chilled to the correct temperature and served with foods that complement their flavors and aromas. If you're new to wine, seek expert advice from restaurant staff or the local wine shop, who can steer you to some of the best dry white wines available.